Photographic Story Like Dalí’s paintings, his house is unique. One of the most unique aspects is the numerous eggs. 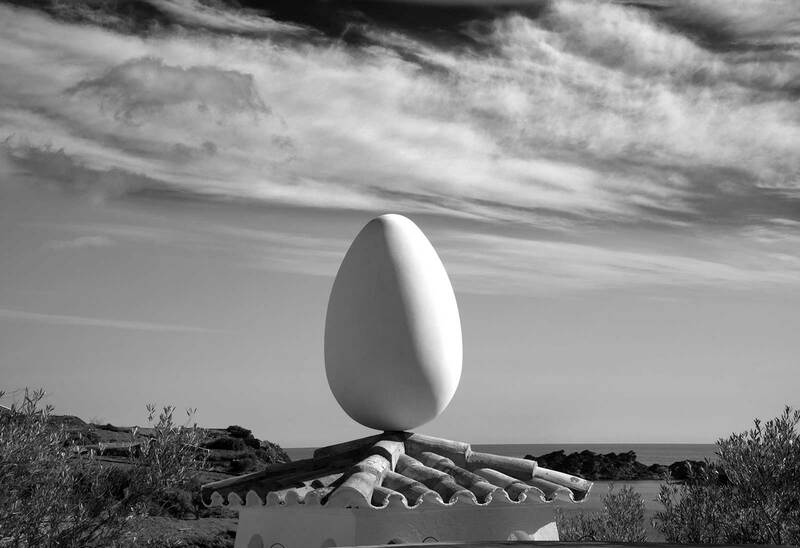 As I waked around photographing outside Dalí’s, I was surprised to find an egg balanced on the dovecote. To me, it is precariously balanced and it causes a certain amount of tension – have you ever tried to balance an egg like that? I learned that the eggs around Dalí’s house are a symbol of rebirth and the connection with natural processes. The egg stands against all the forces of nature, so the tension is also an inspiration. Digital – Archival Pigment Print This photograph was taken with a high-quality digital camera. The photograph is printed on an Epson Stylus 4800 or 11880 printer. Clyde uses archival Ultra-chrome K3 i and prints on archival Harman Hahnemuhle paper. The limited edition photograph is then mounted and matted to current archival standards. This is a limited edition series and each photograph is numbered.